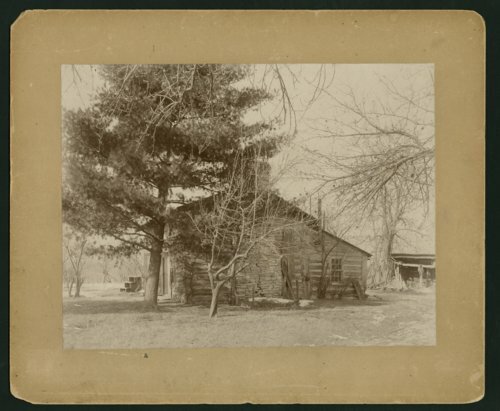 This sepia-colored photograph shows the Adair-Brown cabin in Osawatomie, Kansas. The structure, built around 1854 by Samuel Glenn, was sold in 1855 to John Brown's brother-in-law Samuel Lyle Adair. The cabin provided a home for the Adair family but was frequently used by Brown for abolitionist activities. In 1912, the structure was moved to the highest point in the John Brown Memorial Park which is also the site of the "Battle of Osawatomie" where John Brown and thirty free-state defenders fought in 1856 against 250 pro-slavery militia. A stone pavilion was built in 1928 to protect the cabin's exterior. The state legislature appointed the Kansas Historical Society to maintain the site. In 1971, it was listed on the National Register of Historic Places.